Xian Li (SUNY binghamton); Weiyi Meng (SUNY at Binghamton); Clement Yu (U. Illinois, Chicago)</p>\n', created = 1433151993, expire = 1433238393, headers = '', serialized = 0 WHERE cid = '2:dc0224a344e9f98e429fe579c3a49965' in /var/www/other/ICDE2011/includes/cache.inc on line 109.
user warning: UPDATE command denied to user 'icde2011_wp'@'server2.l3s.uni-hannover.de' for table 'dp_cache_filter' query: UPDATE dp_cache_filter SET data = '<p>The 2011 edition of the IEEE International Conference on Data Engineering is being held in the city of Hannover, Germany from March 11th to 16th. Since 1984, ICDE has established itself as a premier forum in the area of data management, providing a unique opportunity for database researchers, users, practitioners, and developers to exchange new ideas, approaches, and methodologies.</p>\n', created = 1433151993, expire = 1433238393, headers = '', serialized = 0 WHERE cid = '1:bd175c67642513a0e2c0d7a470c26bb8' in /var/www/other/ICDE2011/includes/cache.inc on line 109.
user warning: UPDATE command denied to user 'icde2011_wp'@'server2.l3s.uni-hannover.de' for table 'dp_cache_filter' query: UPDATE dp_cache_filter SET data = '<h3>\n	<a name=\"poster1\"></a>Poster Coffee 1</h3>\n<p>\n	April 12, 2011, Tuesday:&nbsp; 15:30 &ndash; 16:30</p>\n<p>\n	Location: Niedersachsen Halle A</p>\n<p>\n	Accurate Latency Estimation in a Distributed Event Processing System<br />\n	Badrish Chandramouli (Microsoft Research); Jonathan Goldstein (Microsoft Research); Roger Barga (Microsoft Research Redmond); Mirek Riedewald (Northeastern University); Ivo Santos (Microsoft)</p>\n', created = 1433151993, expire = 1433238393, headers = '', serialized = 0 WHERE cid = '2:b9120a2e8c0b068167e1869eeb2e8abb' in /var/www/other/ICDE2011/includes/cache.inc on line 109.
user warning: UPDATE command denied to user 'icde2011_wp'@'server2.l3s.uni-hannover.de' for table 'dp_cache_filter' query: UPDATE dp_cache_filter SET data = '<p>&nbsp;<strong><a name=\"demo1\"></a>Demo Sessions 1A, 1B</strong></p>\n<ul>\n<li>\n	Demo 1A: April 12, Tuesday, 11-12:30</li>\n<li>\n	Demo 1B: April 13, Wednesday, 11-12:30</li>\n</ul>\n<p>	Location: Gallery</p>\n<p>	ATOM: Automatic Target-driven Ontology Merging<br />\n	Salvatore Raunich (Universit&auml;t Leipzig) ;Erhard Rahm (U Leipzig)</p>\n', created = 1433151993, expire = 1433238393, headers = '', serialized = 0 WHERE cid = '1:d8007b908b9efd6230858ff00721adbe' in /var/www/other/ICDE2011/includes/cache.inc on line 109.
user warning: UPDATE command denied to user 'icde2011_wp'@'server2.l3s.uni-hannover.de' for table 'dp_cache_filter' query: UPDATE dp_cache_filter SET data = '<p><strong><a name=\"i1\"></a>Industry Session 1: Web-Information Management</strong></p>\n<p>	April 13, Wednesday, &nbsp;11:00 &ndash; 12:30</p>\n<p>	Location: Bonatz Saal</p>\n<p>	Char: Surajit Chaudhuri (Microsoft)</p>\n<p>	Invited Talk: Google Product Search: An End-to-End View from Content Acquisition to Serving User Requests<br />\n	Thomas Hofmann (Google)</p>\n<p>	Project Voldemort: Reliable Distributed Storage<br />\n	Alex Feinberg (LinkedIn)</p>\n<p>	&nbsp;</p>\n<p>	<strong><a name=\"i2\"></a>Industry Session 2: Data Warehousing and Business Intelligence</strong></p>\n', created = 1433151993, expire = 1433238393, headers = '', serialized = 0 WHERE cid = '1:34e00f18f0010894fb0edac3335c5bf6' in /var/www/other/ICDE2011/includes/cache.inc on line 109.
user warning: UPDATE command denied to user 'icde2011_wp'@'server2.l3s.uni-hannover.de' for table 'dp_cache_filter' query: UPDATE dp_cache_filter SET data = '<p><strong><a name=\"r1\"></a>Research 1: Social Networks and Personal Information</strong></p>\n<p>	April 12, Tuesday, 14:00-15:30</p>\n<p>	Location: Blauer Saal</p>\n<p>	Chair: Wolfgang Nejdl (Leibniz U)</p>\n<p>	Interactive Itinerary Planning<br />\n	Senjuti Basu Roy;Sihem Amer-Yahia (Yahoo! Research); Gautam Das (UT Arlington); Cong Yu (Google Research)</p>\n', created = 1433151993, expire = 1433238393, headers = '', serialized = 0 WHERE cid = '1:783f8e24b82b29b868155be119d13b5f' in /var/www/other/ICDE2011/includes/cache.inc on line 109.
user warning: UPDATE command denied to user 'icde2011_wp'@'server2.l3s.uni-hannover.de' for table 'dp_cache_filter' query: UPDATE dp_cache_filter SET data = '<p><strong><a name=\"panel1\"></a>Panel 1</strong></p>\n<p>	April 13, Wednesday:&nbsp; 17:00 &ndash; 18:30</p>\n<p>	Location: Niedersachsen Halle B</p>\n<p>	<strong>Distributed Data Management in 2020?</strong></p>\n<p>	Moderators: M. Tamer &Ouml;zsu (Univ. Waterloo, Canada), Patrick Valduriez (INRIA, France)</p>\n<p>	Panelists: Serge Abiteboul (INRIA, France), Bettina Kemme (McGilll Univ., Canada), Ricardo Jim&eacute;nez-P&eacute;ris (Univ. of Madrid, Spain), Beng Chin Ooi (National Univ. of Singapore)</p>\n<p>	&nbsp;</p>\n', created = 1433151993, expire = 1433238393, headers = '', serialized = 0 WHERE cid = '1:4a6de7db11e76beef2db6aac25e67b7a' in /var/www/other/ICDE2011/includes/cache.inc on line 109.
user warning: UPDATE command denied to user 'icde2011_wp'@'server2.l3s.uni-hannover.de' for table 'dp_cache_filter' query: UPDATE dp_cache_filter SET data = '<p>Following Seminars will held during ICDE 2011:</p>\n<ul>\n<li>\n	<a href=\"#seminar1\">Non-Metric Similarity Search Problems in Very Large Collections</a></li>\n<li>\n	<a href=\"#seminar2\">Next Generation Data Integration for the Life Sciences</a></li>\n<li>\n	<a href=\"#seminar3\">Modern B-tree Techniques</a></li>\n<li>\n	<a href=\"#seminar4\">Keyword-based Search and Exploration on Databases</a></li>\n<li>\n	<a href=\"#seminar5\">Query Optimizer Plan Diagrams: Production, Reduction and Applications.</a></li>\n<li>\n	<a href=\"#seminar6\">Schemas for Safe and Efficient XML Processing</a></li>\n</ul>\n<p>	&nbsp;</p>\n', created = 1433151993, expire = 1433238393, headers = '', serialized = 0 WHERE cid = '1:48b0fd6244b99cfa05f563ec39e782c2' in /var/www/other/ICDE2011/includes/cache.inc on line 109. 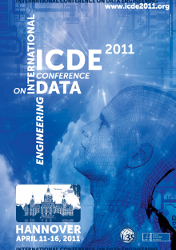 The 2011 edition of the IEEE International Conference on Data Engineering is being held in the city of Hannover, Germany from March 11th to 16th. Since 1984, ICDE has established itself as a premier forum in the area of data management, providing a unique opportunity for database researchers, users, practitioners, and developers to exchange new ideas, approaches, and methodologies. All authors are invited to give in addition to the regular 20 min presentation of their paper also a 2 minute teaser talk and to present a poster during the poster coffee. In the following we give more details on the preparation of each event. Distributed Data Management in 2020? Query Optimizer Plan Diagrams: Production, Reduction and Applications.